Allow the stoned cherries to swell for two hours in the cherry beer. After they have expanded, heat gently for 20 minutes in a saucepan with the rest of the cherry beer. Allow to cool in the pan. Peel the peaches, halve them and remove the stone. Dig out the hollow somewhat and fill with cherries and juice. Garnish with a bit of whipped cream and shredded almonds. 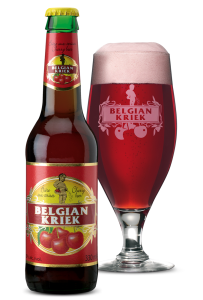 Serve with a nice cold glass of Belgian Kriek (cherry beer).